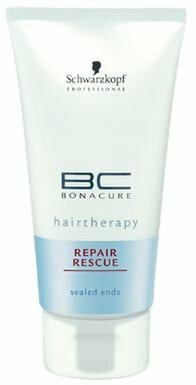 Schwarzkopf BC Bonacure Hairtherapy Repair Rescue Sealed Ends contains provitamin B5 to restructure hair tips. Prevents and seals split ends. With ApHinity Technology: active ingredients (+) sense damaged hair zones (-). Intelligently targets and delivers instant magnet-like hair care. Repairs hair breakage, seals and prevents split ends. CuraTec Proteins and the amino acid ‘Glycine’, aid the repair of split or broken ends. Softens and improves the combability of dry and brittle ends.